Two essays by Solzhenitsyn, with a counterpoint of contributions from six other underground writers who still live in the Soviet Union. Solzhenitsyn is utterly eloquent and utterly bound up in his religious commitment. The Soviets must adopt inwardness and self-restriction: "It requires from each individual a moral step within his power--no more than that. . . . The nation is mystically welded together in a community of guilt, and its inescapable destiny is common repentance. . . . unless we recover the gift of repentance, our country will perish and will drag down the whole world with it." Solzhenitsyn warns the Russians against abetting a Vietnamese revolution and claims that Willy Brandt's "spiritual" opening toward the East bloc was met by "grasping political greed" on the other side. He stresses that the "Russians" must adopt "nil growth" in production and recommends the "Club of Rome arithmetic" sponsored by Gianni Agnelli The other pieces, edited by Solzhenitsyn, are relatively one-dimensional: Mikhail Agursky attacks Communism for "stimulating consumption," a writer called "A. B." adds a commendation of "the abstinent spirit," F. Korsakov cites "the intelligentsia's nonsensical moralism." "Godless humanism which is destroying mankind" receives attack by Evgeny Sarabanov, while a glorification of spiritual revival and national personality by Vadim Borisov recalls nothing so much as volkisch German tracts. Igor Shaferivich winds up with a blast against the notion of progress and a plea for sacrifice. The writers' concept of religion as an ascetic, anti-liberal force--the opposite of expansive concern for all human beings--is, as they themselves stress, a very Russian one. 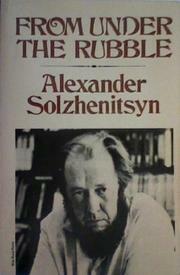 Solzhenitsyn's name and expository power will reach, but not necessarily convert, a broad readership.